With more than 30 years of experience as residential and commercial movers, Supreme Relocation has been providing quality moving services to customers moving to and from Palm Beach and Broward County and all across South Florida. Moving your home, moving your business? Moving from Florida? We provide local moving and long distance moving to anywhere in the USA at fair, honest and competitive pricing. You can rest assured that your move will be done flawlessly because every move is supervised by a Supreme Relocation owner – something a franchised company cannot provide. Supreme Relocation provides free written estimates, expertise in “hard to move” items, full packing services, are licensed and insured and we guarantee to take excellent care of your belongings to make every move as efficient and stress-free as possible. We can also provide long or short term storage to meet your every need. We are the West Palm Beach movers of choice! 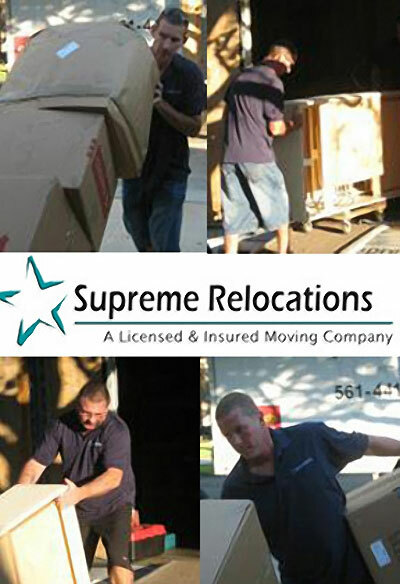 There is a Supreme Relocation owner on every job to ensure a flawless move. Expertise in handling International, Commercial and ‘hard to move’ items. Storage service available; any size, any item, any length of time. Free Written Estimates – We come to your location 7 days a week, during the day or evening, whenever is easiest for you. Our written estimate will outline all the costs associated with your move. Packing and Boxes – We offer full packing services as well as a range of packing materials including boxes, paper, tape and bubble wrap. Many customers decide to pack themselves; we gladly provide packing instruction for no extra charge. If you’d like assistance packing, we can provide a very reasonable quote for you. Insurance – We are State Licensed Movers. Our trucks, your cargo, and our workers are all fully insured. Our Guarantee – We promise to take excellent care of your belongings. We want you to be totally satisfied with your moving experience. Please give us your feedback – good or bad. We are the Florida relocation and moving specialists for all your residential and commercial moving and storage needs. We’re nice guys and you’ll like the way we move! Call us today for a free estimate.